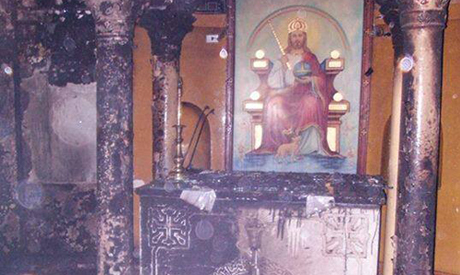 More than 85 churches in Egypt were subject to mob attacks from 30 June 2013 to 30 September 2014, according to a local rights group report issued this week. The report, issued by the Egyptian Commission for Rights and Freedoms detailed alleged attacks on Christians from 30 June last year, when mass protests took place against then-president Mohamed Morsi, through to 30 September of this year. According to the commission’s fieldwork and research, at least 18 Christians were killed because of their religious identity during this period, while 165 houses belonging to Christians were vandalised or burnt down. According to Youssef, the attackers raided the building, home to a nursery, offices, and the priest’s residence, stealing items and then setting fire to parts of the building. Upper Egypt cities bore the brunt of the violence, according to the report, with 80 percent of the clashes and the sectarian strife taking place in Minya, Fayoum and Assiut.The report also cited incidents of abuse by government officials, for example targeting Christians for random arrest during clashes. ECFR has called for an immediate and fair government investigation into all the incidents of violence and sectarianism documented. It also demanded the immediate rebuilding and renovation of all the churches that were damaged during attacks. what Sisi have to do with it?